Costs for building a home can sometimes be higher than anticipated. One-time close construction loans, also called “all-in-one” and “construction-to-permanent” loans, are a popular way to use land equity to build your dream home. Using your land as collateral, these loans combine a construction loan for the building project with a mortgage loan on your finished home. One-time construction loans have one approval process, one closing date and one set of closing costs. But it pays to shop around because details will vary among lenders. Some charge higher interest rates for the construction phase of the loan than for the home mortgage part. Others will lock in a fixed interest rate for the entire loan. Construction loans are more complicated than conventional mortgage loans. You’re taking out a short-term loan for a home that doesn’t exist yet and then converting it into a mortgage after the home is finished. Most lenders will only loan up to 75 percent of the projected appraised value of the home you’re building. Just like when you’re shopping for an existing home, it’s a good idea to get preapproved for a residential construction loan. That way you’ll know from the get-go whether you can borrow enough to build that dream home or adjust your budget and expectations if need be. All lenders look at the same three factors when they’re considering loaning you money: your credit score, income and debt-to-income ratio. These factors determine what your interest rate will be. Run your credit report, dispute any errors you find on it and pay off as much outstanding debt, like credit cards, as you can. How much equity there is in the land you’re using as collateral determines how much a lender will loan you for your home building project. Have your land appraised by a professional appraiser. The lender will probably have one of their own or recommend one. Get your documents in order. Like a standard mortgage loan you will have to provide tax returns, bank statements and pay stubs. You may also have to provide preliminary information on the contractor you intend to use. Your lender will let you know what’s required. 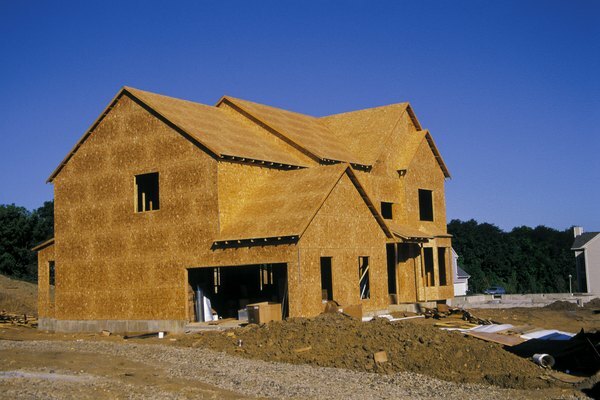 Find a lender who has experience with residential construction financing. Their loan officer can walk you through the process. Different lenders have different interest rates. Naturally, you’ll want to shop for the best rate and terms you can get. One of the hardest parts of applying for a construction loan is coming up with an accurate budget for the home you want to build. A good residential construction lender can help you with this. They should have a budgeting form that you can use to organize the information and be able to suggest ways to control costs so that your application will pass muster. Your contractor should be able to help with this too. The lender will want information and documentation from your contractor to confirm that he’s reputable, and has the resources and experience to get your home built on time and within budget. Yours friends and relatives can provide referrals. Ask prospective contractors if they’ve worked with residential construction loan clients before. Choose one that’s well-established locally. Check for reviews and ratings online. Consider interviewing at least three contractors before you chose one. Ask for and check their references. If you’ve been preapproved, the application process should go pretty smoothly. But construction loan applications using land as collateral require more supporting documentation than standard home loan applications. Your lender wants to be sure that the finished home and the land together will appraise for enough to support what they’re lending you. You’ll need to provide the land deed and any deed restrictions. They’ll ask for documentation on your contractor's experience with residential projects. They will also want proof of his insurance (liability and workers’ compensation) and banking references. A contractor experienced in working with construction loan clients should have no problem providing all of this. You will also be asked to provide a list of materials required for the project and a final budget. Most lenders that handle construction loans have forms for these items. Finally, a signed construction contract that includes critical information like the start and end dates of the project is required. Construction loans are typically issued for 12 months. The lender controls the money, paying it out on a preset schedule at different phases of the construction process. If you go over budget you’ll have to pay the difference and there are penalties for going over the allotted time. Construction loans using land as equity usually have higher interest rates than standard mortgage loans. This is because lenders consider them higher risk. It’s easier to walk away from bare land and, should the lender have to repossess it, it’s harder for them to sell than property with a home on it. Additionally, construction loans are higher maintenance for lenders. There’s more work for them in the application process and in managing the disbursement of funds as construction progresses. During the construction phase your payments will typically be interest-only. The amount is based on how much money has been paid out at any given point. So payments start out small and increase as the project progresses and more funds have been dispersed. When the home is finished, what you borrowed for construction is converted into a mortgage loan and you start paying principal and interest. If you locked in your interest rate at the beginning of this process and interest rates have fallen, most lenders will give you the lower rate. How Much Equity Should I Have in My Home Before I Start Investing?